With Windows 10 version 1703 (also known as the Creator’s Update), both Windows 10 Enterprise E3 and Windows 10 Enterprise E5 are available as online services via subscription. Deploying Windows 10 Enterprise in your organization can now be accomplished with no keys and no reboots. Devices with a current Windows 10 Pro license can be seamlessly upgraded to Windows 10 Enterprise. Product key-based Windows 10 Enterprise software licenses can be transitioned to Windows 10 Enterprise subscriptions. Organizations that have an Enterprise agreement can also benefit from the new service, using traditional Active Directory-joined devices. In this scenario, the Active Directory user that signs in on their device must be synchronized with Azure AD using Azure AD Connect Sync. Inherited Activation: Description of a new feature available in Windows 10, version 1803 and later. The evolution of Windows 10 deployment: A short history of Windows deployment. Requirements: Prerequisites to use the Windows 10 Enterprise subscription model. Benefits: Advantages of Windows 10 Enterprise + subscription-based licensing. How it works: A summary of the subscription-based licensing option. Virtual Desktop Access (VDA): Enable Windows 10 Subscription Activation for VMs in the cloud. For information on how to deploy Windows 10 Enterprise licenses, see Deploy Windows 10 Enterprise licenses. Inherited Activation is a new feature available in Windows 10, version 1803 that allows Windows 10 virtual machines to inherit activation state from their Windows 10 host. When a user with Windows 10 E3 or E5 license assigned creates a new Windows 10 virtual machine (VM) using a Windows 10 local host, the VM inherits the activation state from a host machine independent of whether user signs on with a local account or using an Azure Active Directory (AAD) account on a VM. To support Inherited Activation, both the host computer and the VM must be running Windows 10, version 1803 or later. The original version of this section can be found at Changing between Windows SKUs. 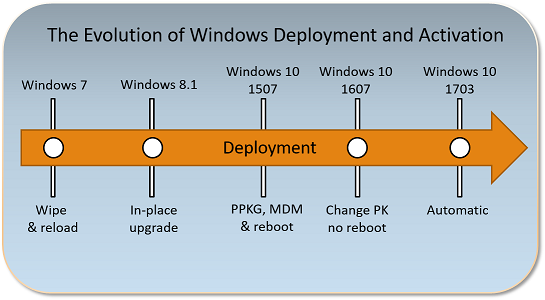 The following figure illustrates how deploying Windows 10 has evolved with each release. With this release, deployment is automatic. Windows 7 required you to redeploy the operating system using a full wipe-and-load process if you wanted to change from Windows 7 Professional to Windows 10 Enterprise. Windows 8.1 added support for a Windows 8.1 Pro to Windows 8.1 Enterprise in-place upgrade (considered a “repair upgrade” because the OS version was the same before and after). This was a lot easier than wipe-and-load, but it was still time-consuming. Windows 10 1507 added the ability to install a new product key using a provisioning package or using MDM to change the SKU. This required a reboot, which would install the new OS components, and took several minutes to complete. However, it was a lot quicker than in-place upgrade. Windows 10 1607 made a big leap forward. Now you can just change the product key and the SKU instantly changes from Windows 10 Pro to Windows 10 Enterprise. In addition to provisioning packages and MDM, you can just inject a key using SLMGR.VBS (which injects the key into WMI), so it became trivial to do this using a command line. Windows 10 1703 made this “step-up” from Windows 10 Pro to Windows 10 Enterprise automatic for those that subscribed to Windows 10 Enterprise E3 or E5 via the CSP program. Windows 10 1709 adds support for Windows 10 Subscription Activation, very similar to the CSP support but for large enterprises, enabling the use of Azure AD for assigning licenses to users. When those users sign in on an AD or Azure AD-joined machine, it automatically steps up from Windows 10 Pro to Windows 10 Enterprise. Windows 10 1803 updates Windows 10 Subscription Activation to enable pulling activation keys directly from firmware for devices that support firmware-embedded keys. It is no longer necessary to run a script to perform the activation step on Windows 10 Pro prior to activating Enterprise. For virtual machines and hosts running Windows 10, version 1803 Inherited Activation is also enabled. Windows 10 (Pro or Enterprise) version 1703 or later installed and activated on the devices to be upgraded. Azure Active Directory (Azure AD) available for identity management. Devices must be Azure AD-joined or Active Directory joined with Azure AD Connect. Workgroup-joined devices are not supported. An issue has been identified with Hybrid Azure AD joined devices that have enabled multi-factor authentication (MFA). If a user signs into a device using their Active Directory account and MFA is enabled, the device will not successfully upgrade to their Windows Enterprise subscription. To resolve this issue, the user must either sign in with an Azure Active Directory account, or you must disable MFA for this user during the 30-day polling period and renewal. For Microsoft customers that do not have EA or MPSA, you can obtain Windows 10 Enterprise E3 or E5 through a cloud solution provider (CSP). Identity management and device requirements are the same when you use CSP to manage licenses, with the exception that Windows 10 Enterprise E3 is also available through CSP to devices running Windows 10, version 1607. For more information about obtaining Windows 10 Enterprise E3 through your CSP, see Windows 10 Enterprise E3 in CSP. Licenses for Windows 10 Enterprise are checked based on Azure Active Directory (Azure AD) credentials, so now businesses have a systematic way to assign licenses to end users and groups in their organization. Support for mobile worker/BYOD activation; transition away from on-prem KMS and MAK keys. Compliance support via seat assignment. When a licensed user signs in to a device that meets requirements using the Azure AD credentials associated with a Windows 10 Enterprise E3 or E5 license, the operating system turns from Windows 10 Pro to Windows 10 Enterprise and all the appropriate Windows 10 Enterprise features are unlocked. When a user’s subscription expires or is transferred to another user, the Windows 10 Enterprise device reverts seamlessly to Windows 10 Pro edition, after a grace period of up to 90 days. Devices currently running Windows 10 Pro, version 1703 or later can get Windows 10 Enterprise Semi-Annual Channel on up to five devices for each user covered by the license. This benefit does not include Long Term Servicing Channel. Scenario #1: You are using Windows 10 1803 or above, and just purchased Windows 10 Enterprise E3 or E5 subscriptions (or have had an E3 or E5 subscription for a while but haven’t yet deployed Windows 10 Enterprise). All of your Windows 10 Pro devices will step-up to Windows 10 Enterprise, and devices that are already running Windows 10 Enterprise will migrate from KMS or MAK activated Enterprise edition to Subscription activated Enterprise edition when a Subscription Activation-enabled user signs in to the device. Scenario #2: You are using Windows 10, version 1607, 1703, or 1709 with KMS for activation, and just purchased Windows 10 Enterprise E3 or E5 subscriptions (or have had an E3 or E5 subscription for a while but haven’t yet deployed Windows 10 Enterprise). The command causes the OS to change to Windows 10 Enterprise and then seek out the KMS server to reactivate. This key comes from Appendix A: KMS Client Setup Keys in the Volume Activation guide. It is also possible to inject the Windows 10 Pro key from this article if you wish to step back down from Enterprise to Pro. Scenario #3: Using Azure AD-joined devices or Active Directory-joined devices running Windows 10 1709 or later, and with Azure AD synchronization configured, just follow the steps in Deploy Windows 10 Enterprise licenses to acquire a $0 SKU and get a new Windows 10 Enterprise E3 or E5 license in Azure AD. Then, assign that license to all of your Azure AD users. These can be AD-synced accounts. The device will automatically change from Windows 10 Pro to Windows 10 Enterprise when that user signs in. In summary, if you have a Windows 10 Enterprise E3 or E5 subscription, but are still running Windows 10 Pro, it’s really simple (and quick) to move to Windows 10 Enterprise using one of the scenarios above. If you’re running Windows 7, it can be more work. A wipe-and-load approach works, but it is likely to be easier to upgrade from Windows 7 Pro directly to Windows 10 Enterprise. This is a supported path, and completes the move in one step. This method also works if you are running Windows 8.1 Pro. Devices that have been upgraded will attempt to acquire licenses every 30 days, and must be connected to the Internet to be successful. Licenses are valid for 90 days. If a device is disconnected from the Internet until its current license expires, the operating system will revert to Windows 10 Pro. As soon as the device is connected to the Internet again, the license will automatically renew assuming the device is still present on list of user devices. Up to five devices can be upgraded for each user license. The list of devices is chronological and cannot be manually modified. If a device meets requirements and a licensed user signs in on that device, it will be upgraded. If five devices are already on the list and a subscribed user signs in on a sixth device, then this new device is added to the end of the list and the first device is removed. Devices that are removed from the list will cease trying to acquire a license and revert to Windows 10 Pro when the grace period expires. Licenses can also be reallocated from one user to another user, allowing you to optimize your licensing investment against changing needs. When you have the required Azure AD subscription, group-based licensing is the preferred method to assign Enterprise E3 and E5 licenses to users. For more information, see Group-based licensing basics in Azure AD. If you are running Windows 10, version 1803 or later, Subscription Activation will automatically pull the firmware-embedded Windows 10 activation key and activate the underlying Pro License. The license will then step-up to Windows 10 Enterprise using Subscription Activation. This automatically migrates your devices from KMS or MAK activated Enterprise to Subscription activated Enterprise. If you are using Windows 10, version 1607, 1703, or 1709 and have already deployed Windows 10 Enterprise, but you want to move away from depending on KMS servers and MAK keys for Windows client machines, you can seamlessly transition as long as the computer has been activated with a firmware-embedded Windows 10 Pro product key. Organizations with a traditional EA must order a $0 SKU, process e-mails sent to the license administrator for the company, and assign licenses using Azure AD (ideally to groups using the new Azure AD Premium feature for group assignment). For more information, see Enabling Subscription Activation with an existing EA. The license administrator can assign seats to Azure AD users with the same process that is used for O365. New EA/SA Windows Enterprise customers can acquire both an SA subscription and an associated $0 cloud subscription. Organizations with MPSA are automatically emailed the details of the new service. They must take steps to process the instructions. Existing MPSA customers will receive service activation emails that allow their customer administrator to assign users to the service. New MPSA customers who purchase the Software Subscription Windows Enterprise E3 and E5 will be enabled for both the traditional key-based and new subscriptions activation method. See Deploy Windows 10 Enterprise licenses. Subscriptions to Windows 10 Enterprise are also available for virtualized clients. Windows 10 Enterprise E3 and E5 are available for Virtual Desktop Access (VDA) in Windows Azure or in another qualified multitenant hoster. Virtual machines (VMs) must be configured to enable Windows 10 Enterprise subscriptions for VDA. Active Directory-joined and Azure Active Directory-joined clients are supported. See Enable VDA for Subscription Activation.